The breakfastroom area has looked like this for quite some time and I have really enjoyed it. However, maybe something a little different for Fall and Winter. 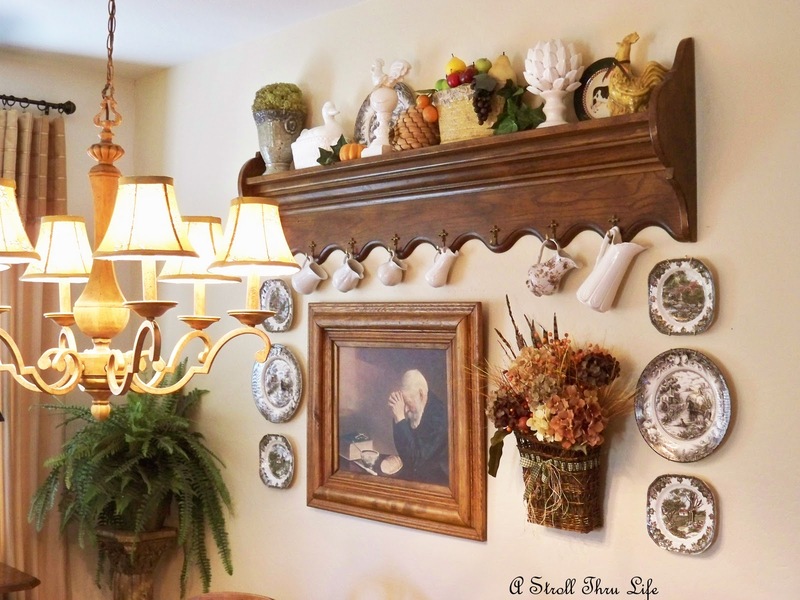 So, I changed out the plates and a few of the shelf accessories for a little bit of a different look on the wall collage. Of course the table centerpiece changes constantly, but for now it still has the dough bowl full of pumpkins, gourds and fall leaves. I am not a believer that everything has to change to create a different look. Some things are just the perfect size and shape, so they stayed. While the shelf is quite massive in it's size, the depth of the shelf is only 5 inches, so I have to choose items that are rather narrow to fit, and the duck tureen, yellow cache pot and the artichoke are all just perfect. They have some presence, but they are narrow, so they fit the shelf. An urn with a moss ball, two plates and a different rooster is all that switched on the shelf. I used one of the haystack plates on this end to tie the shelf into the wall collage. 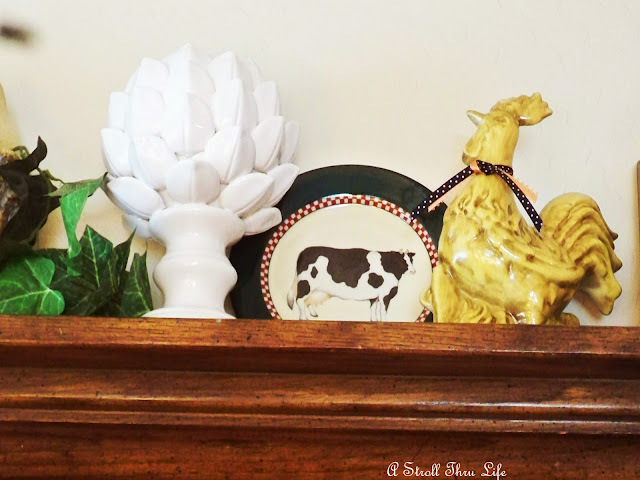 I think this little cow plate is so cute, and of course the little yellow rooster is a favorite. 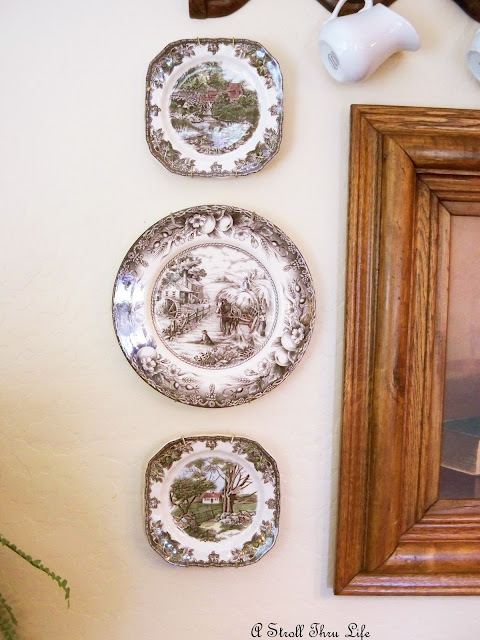 I love the black transferware plates and used 3 different scenes to change out the plates in the collage. The covered bridge, haystack and farmhouse. Same scenes on this side of the collage. Fun for a change and has a totally new look. This. What do you think? Also, don't forget we are having our Fall Cloche party on Nov. 1st, and my Burlap bag giveaway is still going on also. Just click on the pics on the side bar for details and to enter. I am loving the new look. Those plates are just gorgeous. You always have the best accessories. I hope you will drop by tonight and link up to the party. This would be a perfect post. Very pretty change for the fall! I love your decor. The wooden shelf is precious as are your plates. Yes, I love the simple change out for Fall, Marty! While I love green plates, myself, the darker transferware really cozies the space up. I agree, too, not everything has to be changed out. Sometimes I just like something where it is too much to move, so I keep it in and add around it. Nice changes! Those plates are so pretty and go so well with everything on your shelf. That looks wonderful, Marty. You have it displayed so perfectly. Love the transferware. Love the change. Especially the transfer plates, those are GORGEOUS! Love all the transferware!! gorgeous! I love the spring version but this does give it an autumn feel and some coziness.. very pretty indeed. As always, such new arrangements. You have the nicest things to work with. I wish I had the courage to change things more frequently. When I do, I sometimes get stuck and can't quite get it to look just right. You always provide great ideas and inspiration for me. Thanks for sharing. Loving the change. It looked good before too. I love brown and white transferware! That may be a small change, but it makes a huge impact Marty. I really like the hooks on the bottom of the shelf, you gave me an idea, I just may have to try sometime. Looks pretty. I love your table arrangement too. I love transfer ware and I've just started collecting some of the brown. loved it before -love it now- amazing how different it can look- the plates are gorgeous! All of your arrangements are so pretty, Marty! This is perfect! Well, you know I LOVE this new look! The plates on the wall with the white creamers is WoW!!!! Your vignette on top adds so much too. I think it adds up to more than a little change. Love it! A lovely look! 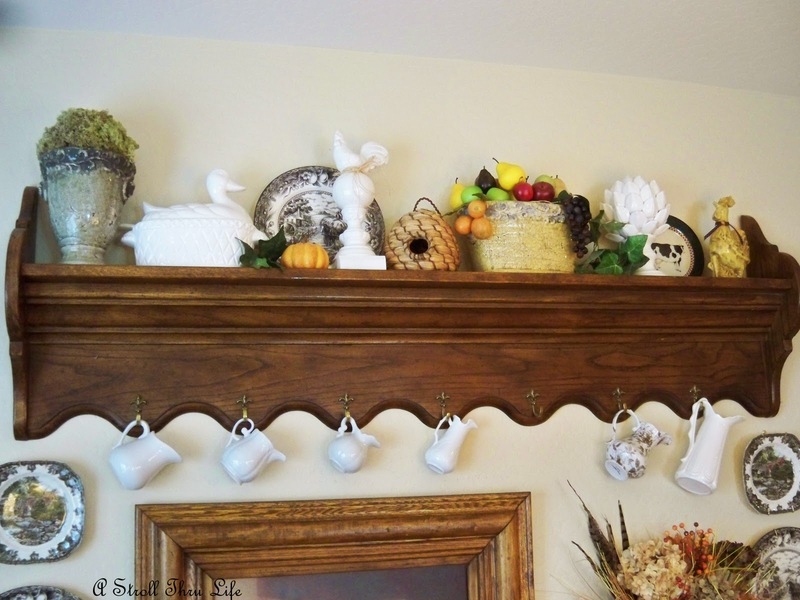 I especially like the transferware plates and the wooden shelf is so pretty. Wishing you a great week, Marty. I think that it is amazing how these little differences can change the total look. Love your transferware plates...so pretty for the season. I love that new look. Subtle is best. It's fun to change things up. I don't often do major changes either. Love your transferware. So pretty, love the set of 3, and your shelf with all the pretties on it too. I think the black transfer ware plates are the perfect change up for fall! Well done! Love the new look! Looks so colorful and rich! Marty, the changes look great! I love the new look! 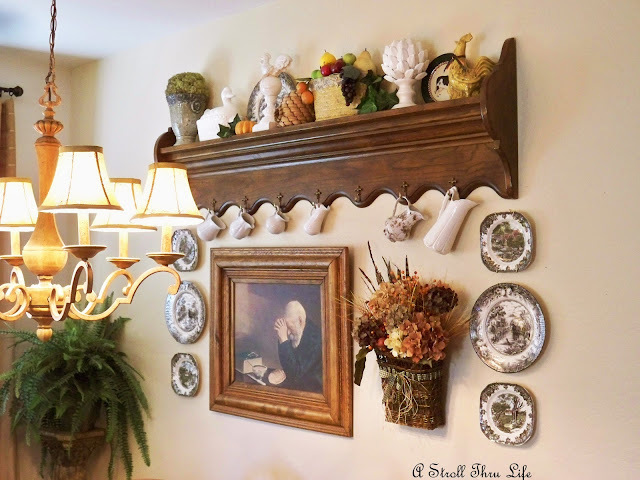 The wooden shelf is perfect for displaying your beautiful items! 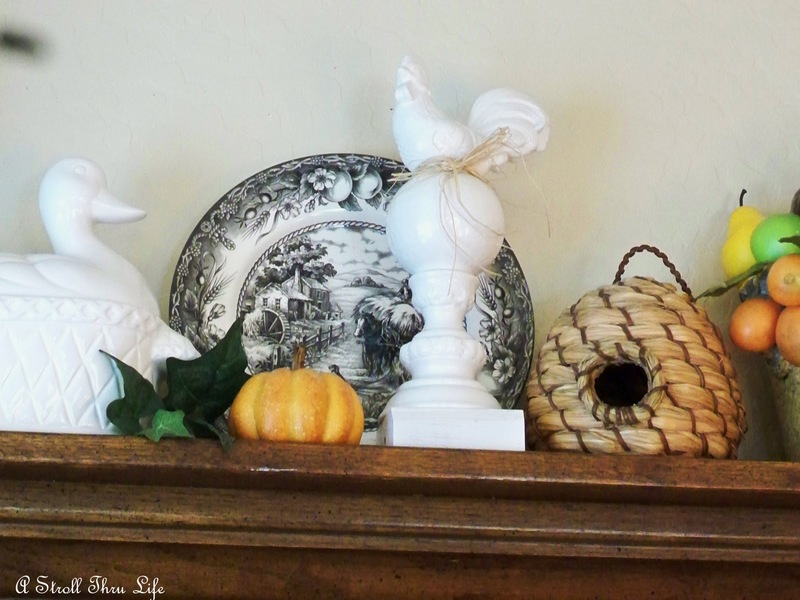 Transferware is one of my favorites too! Lovely! It was pretty before, and even nicer after! I love, love, LOVE those transferware plates! They actually had the effect of brightening the space, I think! Your little creamers all in a row are just precious. I love the changes for the season, especially those brown plates. You know, before blog land I rarely did that with things like walls and shelves to the extent that I do now. You've been an inspiration in that area. I love how you switch things up. I love what you did with your wall collage, Marty! Tell us about your plates--they look like Friendly Village, but I haven't seen those in black. Love them! I love your new look Marty! Those plates are some of my faves and the arrangement just pops with the shelf. Are you cooling off a bit? My Mom left for Az. today to see my brother in Flagstaff and my son in Phoenix. Hope all is well with you! I love the changes! The transferware is so pretty! And thanks for stopping by - you always say the nicest things! Nice look for the fall! HI Marty,love this change! so fallish. Have you shared this pattern name for your china? Also, since I a fairly new follower, love your curtains in the living room. Where did you find them. If you have posted that already, maybe you could share what post it was in. 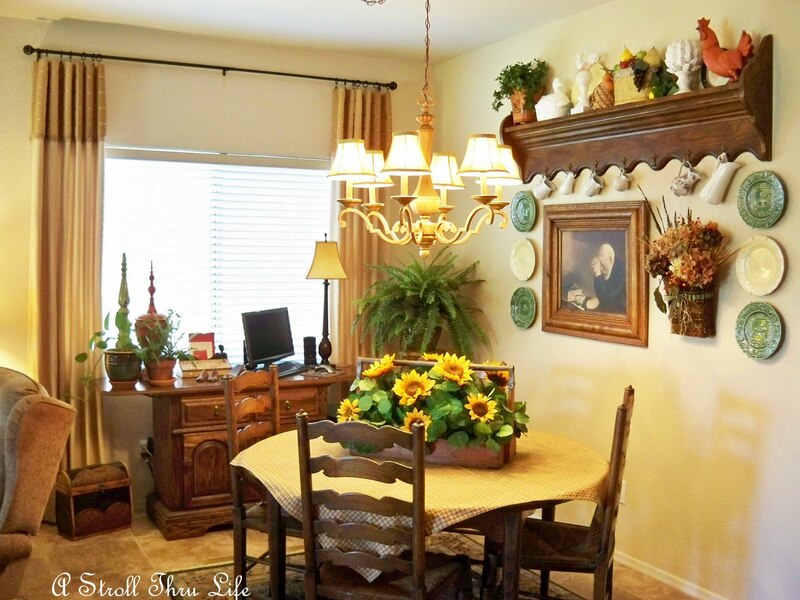 Love all your colors, beautiful home! adore the black and white transfer ware. homey and yet very elegant! The change looks great! Perfect for fall. Amazing how changing just a few things can give you a totally different look. Everything looks just perfect! I have admired your transferware and ironstone so much on prior posts. 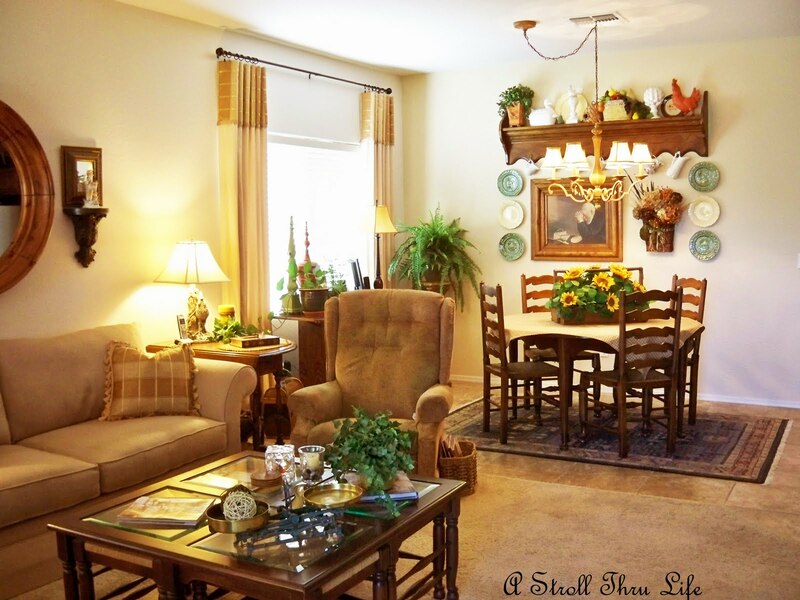 You have a knack of changing up to always showcase them both so well and the fall touches are great. Thanks so much for visiting my blog today! I love discovering new blogs through comments. I'll have to spend some time poking around! I love the changes you made, especially those dishes! wow your house is beautiful! 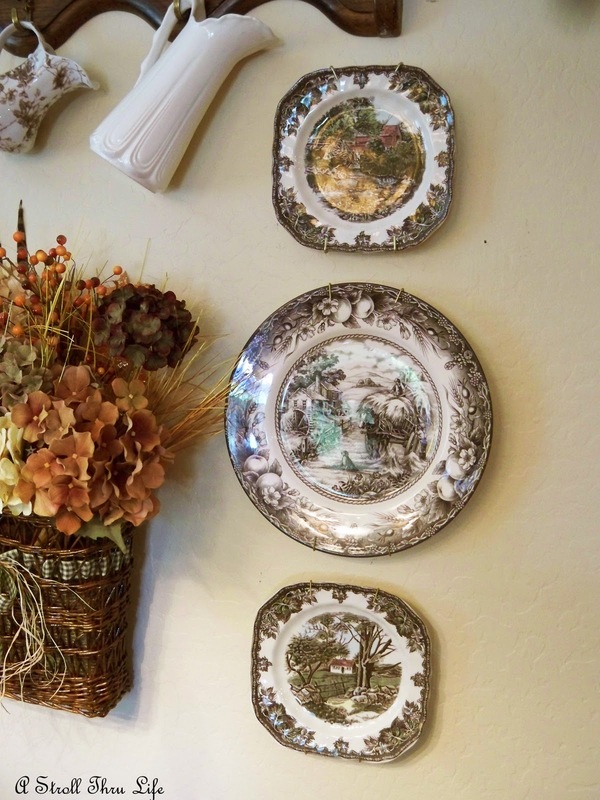 i love plates on walls, my husband isn't a big fan, but after seeing yours I'm sold! Thanks for sharing!! 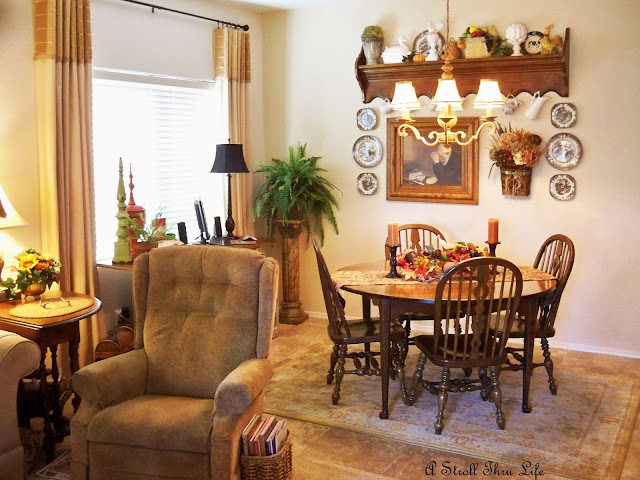 You certainly did do a great job...Love the plates and change on the table...I was pretty fond of that red chicken on the shelf, but sometimes things need to be changed...Your home is lovely! Everything looks so purty!! I thought my eyes were playing tricks on me. the table and chairs are different too! I like it much better!! Beautiful! 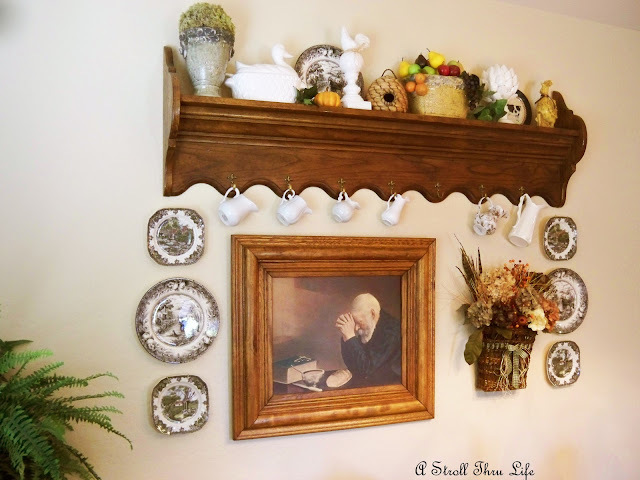 I adore how the plates on the wall and shelf continue the hues of your pitcher collection! Softt and soothing!!! Keep the inspiration coming! A small change that makes such an impact! Love all the pitchers hanging on the hooks! Marty, Love the plates and they are beautiful with your shelf. This is a perfect Fall look. Thank you for linking to my party this week. I am mad for brown transferware as you know Marty! That arrangement is so pretty too! Love the new fall look, just lovely. I've Passed the Versatile Blogger Award to you.Here's a link to my blog post about it. That is so lovely Marty! It completely captures the essence of "Harvest" and I just love those plates. Thank you so much for sharing this with us at Inspiration Friday this week! The addition of the black transferware is just beautiful! I agree that you don't have to swap everything out to get a new look. I was doing a bit of a swap out today as well. Love plates on a wall. The arrangement is very pretty and I also like your new header. Like the big pictures across the top. I know you keep changing them. You always have the prettiest displays/vignettes, Marty. Love the plates! Beautiful. That shelf is amazing. Beautiful changes Marty! The plates are gorgeous! This is ne of the reasons I don't mind joust buying a couple of very pretty plates at a bargain prices. I love to use them for decor. Thank you for sharing them with us at TTF and have a happy November 1st! Beautiful Marty! Love the transferware! Thank you for linking up with Home Sweet Home! So gorgeous Marty!!! I love the transferware and the way you have displayed everything- thanks for sharing at my party!